It's a themed room filled with clues, codes, and puzzles that a group of adventurers must find, solve, and put together in order to complete a mission before time runs out! ...an award-winning, 5-star rated, escape game venue with four immersive themed adventures centrally located in Mount Airy, MD. "...SO much fun for a group." -Kelly F.
"...the best designed escape room I've ever played." -Scott M.
"...a great time, good puzzles, definitely worth checking out!" -Bill P.
"...difficult, well-designed rooms with great surprises along the way." -Colin C.
"...super nice and friendly....highly recommend!" -Ian H.
"...the best hour ever!" 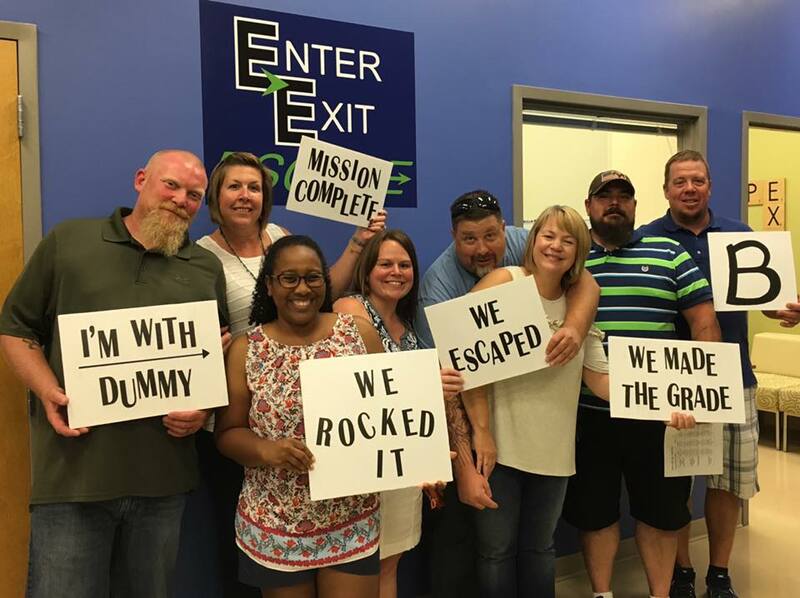 - Amy S.
Check out our ESCAPE ROOMS page to find out more about the three room themes, challenge levels, and recommended number of participants. Peruse the FAQs page to get lots of important and useful information that will likely answer all your potential questions. Gather a group of friends, family, co-workers, and fellow adventurers. BOOK A ROOM of choice online, depending on number of people, theme interest, and room availability. We encourage all adults to book their spot individually and watch the video for the room. For larger groups, celebrations, or team-building experiences, contact us directly so that we may schedule a special time and facilitate all the unique details your group may desire. Arrive 20 minutes before your booked time. Enjoy the large, welcoming, and puzzle-laden lobby while we prepare your room and you prepare to have fun. Learn from staff about rules and expectations, and have final questions answered. ENTER your room, where you'll learn more about your adventure and your Game Master will share the goals of your game. Work with your team, using your wits, skills, and observations. Interact with the props, environment, puzzles, and clues to arrive ever closer to your goal, all while the clock is ticking. Request a clue from your Game Master, as needed. There is no time penalty, but you are limited to 3 clues per game. EXIT the room by completing the stated mission. Do this within 60 minutes, and you have ESCAPED!! Spread the excitement of your experience. If you enjoyed yourselves, please share photos, anecdotes, posts, and reviews. And by all means, tell us how you think we may improve. We are always striving to provide the best customer experience possible! Repeat! We have three rooms and our themes will change periodically. So come on back for a new and unique experience. Unlock your business team's potential by scheduling your corporate team building event with us! Consider booking your next celebration with us! Find more information on our CORPORATE page and PRIVATE EVENTS page and LARGE-SCALE MOBILE GAME page. Contact us to plan your exciting event. Join our growing group of fans to receive exciting news, information about special events, and promotional deals. Sign up below.